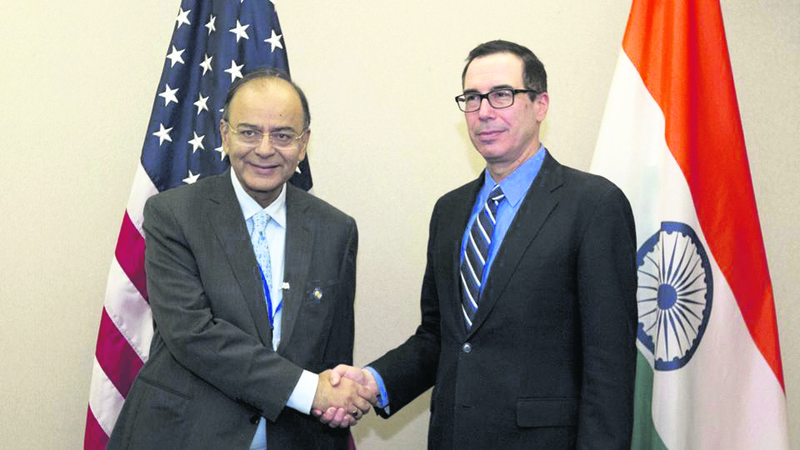 India's Finance Minister Arun Jaitley raised the issue of tightening of the H1B visa regime with US counterpart treasury secretary Steven Mnuchin during their first meeting, highlighting the contribution of Indian firms and professionals to the US economy. During his visit to attend the annual Spring Meetings of the International Monetary Fund and the World Bank, Jaitley raised the issue two times, effectively bringing to light India's contribution to the USA. Both, Jaitley and Mnuchin discussed a wide range of bilateral issues during their meeting, including international cooperation against terror financing. The Indian FM highlighted the notable progress made in the Indo-US relations over the last few years and India's ambitious reform agenda which was creating new opportunities towards a deeper economic engagement between the two countries, as revealed in a finance ministry statement. “Critical economic issues like Indo-US investment initiative, infrastructure collaboration and NIIF (National Investment and Infrastructure Fund), collaboration with the US for Smart Cities Development were deliberated upon during the meeting.” The issue of H1B visas for skilled professionals from India was raised and the contribution of Indian companies and professionals to the US economy was highlighted, as per the statement. Just last week, US President Donald Trump signed an executive order to tighten the rules of the H1B visa programme in order to stop its “abuse” and ensure that the visas are given to the “most-skilled or the highest paid” petitioners, in a decision impacting India's $150 billion IT industry. A Trump administration official complained that Indian IT firms Tata Consultancy Services, Infosys and Cognizant unfairly get the lion's share of H-1B visas by putting extra tickets into the lottery system, which the Trump administration wants to replace with a 'merit-based' immigration policy. The official said that a small number of giant outsourcing firms flood the system with applications, which increases their chances of success in the lottery draw. "You may know their names well, but like the top recipients of the H-1B visa are companies like Tata, Infosys, Cognizant - they will apply for a very large number of visas, more than they get, by putting extra tickets in the lottery raffle, if you will, and then they'll get the lion's share of visas," the senior official said. Asked why Indian companies were singled out for mention, he responded that TCS, Infosys and Cognizant were the top three recipients of H-1B visas. "And those three... have an average wage for H-1B visas between $60,000 and $65,000 (a year). By contrast, the median Silicon Valley software engineer's wage is probably around $150,000," the official said. While TCS and Cognizant did not offer a comment, Infosys said, "We have provided a statement on the H-1B matter earlier. At this point we have nothing additional to add."